Superb villages you’ll kick yourself for not exploring until now! Snettisham – We know what you’re thinking. Where? Stay with us and we’ll guarantee we’ll persuade you to visit more often! 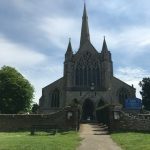 The village of Snettisham is situated on the North Norfolk coast, just a few miles from the royal residence at Sandringham and boasts a superb RSPB reserve, award winning 15th century coaching inn and Snettisham Park Farm, a working farm offering fantastic family days out, what more can you want? Approaching this stunning village from either direction is so incredibly pleasing to the eye, even more so at this time of year. Flowers are in full bloom and the trees and fields are bursting with colour and life. If you’re enjoying a holiday in the village or spending the day on the coast, a visit to the Rose & Crown is a must. The 14th century coaching inn has provided respite for weary travellers for nearly 700 years (the staff have changed since then ha!) and in 2015 it was awarded UK pub of the year. It ticks all the boxes – suitable for couples, dog walkers, families, the list goes on. With a beautiful fully enclosed garden and fantastic pirate ship play area there’s plenty of room for the children to let off some steam whilst you enjoy and well-earned Gin and Tonic! Meander up the road and enjoy the stunning views across the countryside. At the top of the road standing proudly over the village is St Mary’s Church, this building has had to withstand many threats such as World War One zeppelins. As well as it being steeped in history, Snettisham has been the location of several important archaeological discoveries, which can now be seen in Norwich Castle Museum and British Museum. Don’t judge a book by its cover – we meant it when we said this beautiful village has a lot to offer! 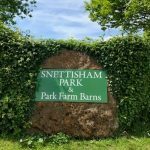 If you’re searching for a superb family day out, you have to visit Snettisham Park Farm. Spread across 350 acres it offers visitors the chance to get up close to the various livestock with their daily feeds. They also offer a deer safari which is a fabulous experience and a real treat to admire an animal that you don’t often see so close, with that being said watch your pockets, the deer are very intelligent and know that you might have a something for them! Staying on the animal theme if you’re a keen birdwatcher you have to visit the RSPB reserve. Even for the not so experienced this is a superb attraction all year round, however if the opportunity arises and you’re in the area during the winter months, thousands of pink-footed geese fly in to feed and it really is a breath-taking spectacle. During the Summer, large numbers of black-headed gulls and common terns nest on the reserve so it’s always bursting with life. Sounds idyllic? What are you waiting for – get booking!